Riya Kumar is one of the first founding members of Fuzia. She is a confident, self-driven, sassy and meticulous young leader. She began her career as a software engineer and later gave in to doing something she loved – “inspiring people”. Due to her intuitive, empathetic, motivating and amicable demeanour, she was able to foster a beautiful close knit family of members on Fuzia who felt empowered and inspired to become better versions of themselves everyday. Therefore she can be referred to as the “pioneer” of Member Relations on Fuzia. She also hosts interactive and engaging live Facebook/Instagram sessions as she loves talking to people and is not at all camera shy. 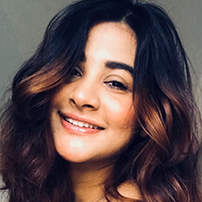 Riya loves challenges and her journey of two and a half years on Fuzia has given her a chance to ingeniously subdue countless of them along the way, eliciting immense growth both on her personal and professional front. She loves reading and is an aficionado of quotes and epigrams. One of her favourite quotes is “Great things never come from comfort zones”. She believes that everyone has a superpower, “to inspire”, and works diligently towards building meaningful relationships and providing a non-judgemental & convivial platform to thousands of Fuzia members who now regard Fuzia as their own family where they feel safe to share their secrets, fears, sorrows and happiness besides emanating various forms of creative expressions.